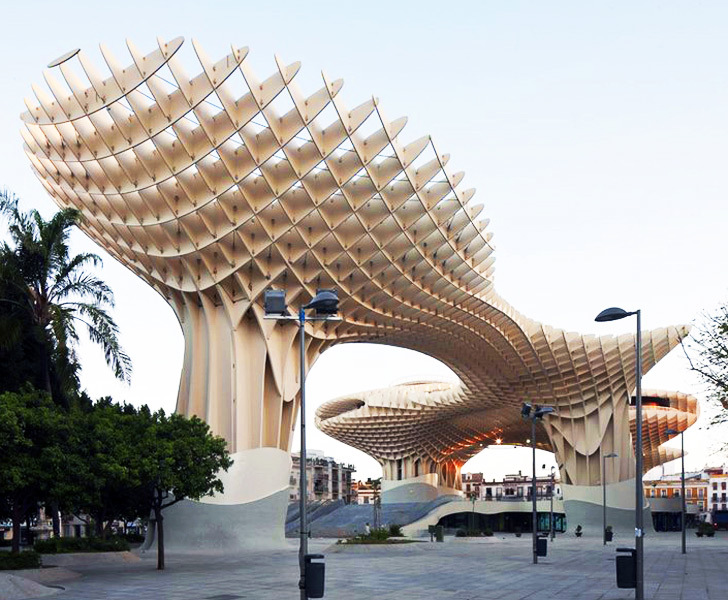 The surreal Metropol Parasol in Seville, Spain is the world's largest wooden structure - and it's been getting lots of attention since its soft-opening last month. The $162 million dollar project designed by Jurgen Mayer H. Architects is an architectural marvel that has been met with both praise and criticism, and it has been immortalized with new photographs by Fernando Alda and David Franck - hit the jump to check them out! Metropol Parasol is situated within the Seville’s historic medieval sector. In fact, it looms over archeological ruins, which have been incorporated into a museum. The honeycomb umbrella roof is now accessible to visitors with a winding terrace and path, offering incredible views of the beautiful city. The open-air structure was based upon the design of parasols, and it also references cathedral design. The underside holds restaurants, shops, a community center and a visitor center. Seville has always been known as an innovator in Europe, and Jurgen Mayer H. Architects wanted to celebrate that with Metropol Parasol. Photographers Alda and Franck have captured the modern and sleek flow of Metropol Parasol, highlighted against the surrounding historic architecture. 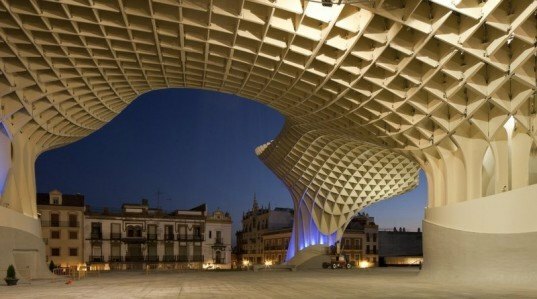 Metropol Parasol is situated within the Seville’s historic medieval sector. In fact, it looms over archeological ruins, which have been incorporated into a museum. The honeycomb umbrella roof is now accessible to visitors with a winding terrace and path, offering incredible views of the beautiful city. The open-air structure was based upon the design of parasols, and it also references cathedral design. The underside holds restaurants, shops, a community center and a visitor center. Seville has always been known as an innovator in Europe, and Jurgen Mayer H. Architects wanted to celebrate that with Metropol Parasol.